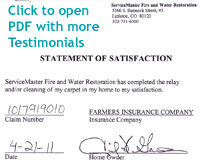 ServiceMaster Fire and Water Restoration has been a trusted provider of disaster restoration and cleaning services in Denver, CO and the surrounding areas since 1989. We are ready 24 hours a day to help homes and businesses in the Denver metropolitan area recover after sustaining damage from a natural disaster. Our trained technicians have IICRC certification and they are properly equipped to restore homes and commercial buildings using advanced cleaning products and techniques. At ServiceMaster Fire and Water Restoration, we are a preferred vendor of local insurance companies and we will help you through the claims process. We are dedicated to getting homes and businesses in the Denver, CO area restored to their original condition as quickly as possible after a disaster. Due to our quality of work and commitment to good customer service, we have been a Star Member of the Better Business Bureau since 2003. We are available at (303) 800-3404 to respond to emergencies in Denver, CO and the surrounding areas. After a fire it is important to get the fire damage repair process started as soon as possible to prevent any further damage. The service technicians at ServiceMaster Fire and Water Restoration respond quickly and are are experts in understanding the chemical combinations that can effectively clean and salvage belongings. You can relax, knowing that your home and possessions will be cleaned, deodorized, and repaired by reliable, knowledgeable professionals. We at ServiceMaster Fire and Water Restoration understand that your home or business is of the utmost importance and whether the loss is large or small, solving the problem is your only concern. That is why we are here to help. Whether it’s a small bathtub overflow or it is raining from the ceiling our technicians will use the newest techniques to care for your home or business. With our state of the art equipment, expertise and prompt response time we can restore your residential or commercial property as quickly as possible. We serve the entire Denver Metro area, Colorado. Mold and mildew can cause more than simple cosmetic damage to your home or business. Inhaling or touching mold can cause allergic reactions and asthma attacks in sensitive individuals. 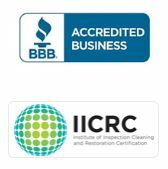 At ServiceMaster Fire and Water Restoration we are certified in mold remediation by the IICRC and the IAQA. We can help you if you have any kind of mold problem. The Denver, CO area experiences its fair share of storms from thunderstorms and heavy wind to blizzards. The severe weather conditions that are common in this area also have the potential to cause serious damage to your home or building. Strong winds can damage the building exterior and heavy rain or flooding can lead to flooding and water damage inside. It is important to address any type of storm damage immediately or its effects will get worse. ServiceMaster Fire and Water Restoration provides storm damage restoration services to help homes and businesses that have been affected by storms in the Denver, CO area. Our technicians can stabilize and repair structural damage as well as remove flood water and excess moisture. ServiceMaster Fire and Water Restoration has developed cleaning procedures to correctly clean your carpets. We will come out to your home, at no charge, and give you an in home estimate on your carpet cleaning needs. We can schedule a convenient cleaning appointment to fit your busy schedule. ServiceMaster Fire and Water Restoration’s courteous and professional technicians are specially trained to clean all types of upholstery from herculon and micro-fiber to Haitian cotton. We serve residential and commercial customers in the entire Denver Metro area, Colorado. 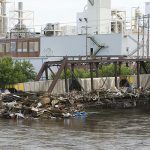 Situations involving biohazard materials, including sewage backups, hoarding situations, serious accidents, or violent crimes are very dangerous. 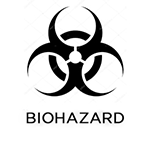 Biohazard materials present a major threat to your health and attempting to clean up these materials will only increase the risk of experiencing infection or disease. It is important to first call emergency responders in such a situation as well as a professional that is licensed to clean up biohazard materials. ServiceMaster Fire and Water Restoration provides biohazard cleaning services to safely clean and restore scenes in Denver, CO affected by these dangerous materials. Our technicians can safely remove biohazard materials from the scene and ensure that the area is properly cleaned and disinfected. Completing a construction or remodeling project on your property is a relief, but the newly constructed area may not be ready to use just yet. It is common for construction sites to be covered in dust and contain leftover debris such as nails, screws, and sheetrock. The debris can make the area hazardous to walk through and the dust left behind can spread throughout the home or building and get into the HVAC system. At ServiceMaster Fire and Water Restoration, we provide post construction cleaning services to clean the sites of recently completed projects in Denver, CO. Our technicians will clean and remove leftover dust and paint and ensure that the area is free of debris. 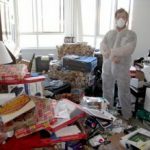 Hoarding is a dangerous disorder that can have serious implications for the person affected and their family who lives in the home. Those affected by hoarding are suffering from anxiety and depression that make it impossible for them to rid of anything in their home. This causes clutter to build up to a dangerous level which increases the risk of fire, injuries, and mold or bacteria growth. It is very important to clean and restore homes affected by hoarding, but the affected individual must agree to clean out the home and be involved in the process. ServiceMaster Fire and Water Restoration provides hoarding cleaning services to help those affected by hoarding in the Denver, CO area. Our technicians can thoroughly clean and restore homes affected by hoarding and we will treat the affected individual with compassion and respect throughout the process. “Cassie and her crews were incredible. She truly made me feel like the patient who finally meets the doctor who can cure his or her ailment. She was prompt, knowledgeable, friendly and professional. Servicemaster is very fortunate to have such a wonderful employee.!"